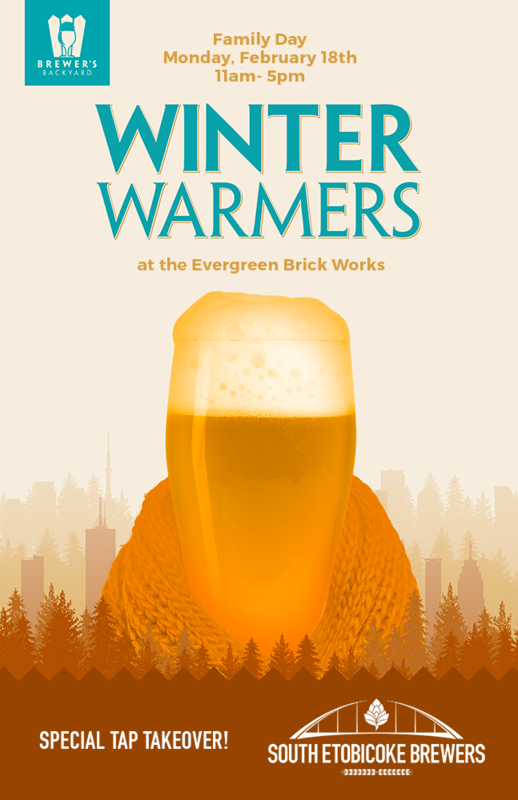 The Brewer’s Backyard is back on Monday, February 18th as part of the Family Day festivities at the Evergreen Brick Works! And what better way to battle this arctic cold we have been having then to warm up with a ‘tap takeover’ by the South Etobicoke Brewers! We have a great line up of breweries which include Big Rock, Black Oak, Indie Alehouse, Great Lakes Brewery and Von Bugle that will be pouring some tasty brews for all to enjoy. On the food front we’ll be having Delight Bite, Los Vietnamita, Arepa Republic and Heirloom. We will be on from 11am – 5pm at the Young Welcome Centre and BMO Atrium areas of the Evergreen Brick Works. Our event will be entirely indoors so we all will stay warm even if it is cold outside. Admission is free, the event is all ages and no tickets are required. We will be having our “First Call” special again with all beers only $5.00 for the first hour. So the early bird gets the beer! We will also have a special collaboration beer – a New England Style Pale Ale made by the South Etobicoke Brewers that will be available to enjoy!